Estimating Lengths of Semitendinosus and Gracilis Tendons by Magnetic Resonance Imaging. Arthroscopy: The Journal of Arthroscopic and Related Surgery. 34(8). 2018:2457-2462. Ilahi, O, Staewen, S, Stautberg, EF, Qadeer, AA. Purpose: To determine whether preoperative magnetic resonance imaging (MRI) can help predict the tendon-only length of the semitendinosus (ST) and the gracilis (G). Methods: The distance from the tibial insertion to the distalmost aspect of the musculotendinous junction (MTJ) of the ST and G was estimated on preoperative MRI scans of patients undergoing primary anterior cruciate ligament (ACL) reconstruction with single-bundle, quadruple-stranded hamstring autograft. This MRI tendon-only length, measured by a musculoskeletal radiologist blinded to surgical findings, was compared to the actual tendon-only length measured upon harvesting each tendon. Results: Among the 42 patients comprising the study population, there was very strong correlation between the estimates of tendon-only length made by MRI and surgical measurements for both the ST (Spearman coefficient ¼ 0.83; P < .0001) and the G (Spearman coefficient ¼ 0.82; P < .0001). The difference between MRI and surgical measurements did not exceed 3 cm for any of the 84 harvested hamstring tendons. Bland-Altman plots confirmed agreement between the 2 measurement methods. There was also strong correlation between the surgically measured tendon-only length of the ST and its G counterpart (Spearman coefficient ¼ 0.68; P < .0001). Conclusions: MRI estimates of tendon-only length for both the ST and G very strongly correlate with operative measurements of these lengths; the discrepancy between these 2 measurement methods was found to not exceed 3 cm when the MTJ of these tendons is visible on MRI scans. Level of Evidence: Level III, comparative study. 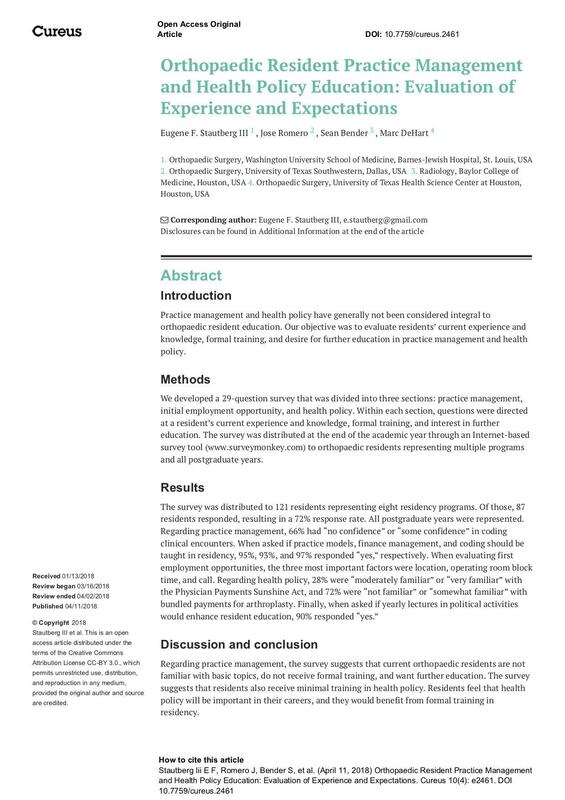 Stautberg, EF, Dehart, M, Romero, J, Bender, S.
Introduction: Practice management and health policy have generally not been considered integral to orthopaedic resident education. Our objective was to evaluate residents’ current experience and knowledge, formal training, and desire for further education in practice management and health policy. Stability of Two versus Three Peripheral Pegs in Modern Total Shoulder Glenoid Components. International Orthopaedics. 2017 Aug 24. doi: 10.1007/s00264-017-3599-7. Stautberg EF, Jupiter DC, Amin A, Qadeer AA, Ilahi O. A. Purpose: In total shoulder arthroplasty (TSA), the optimum number of peripheral pegs required for stability in the glenoid component is unknown. 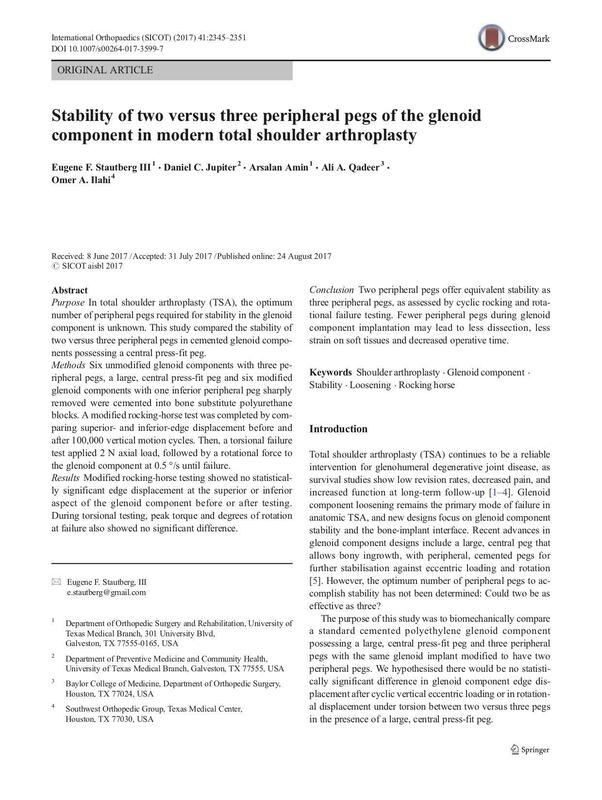 This study compared the stability of two versus three peripheral pegs in cemented glenoid compo- nents possessing a central press-fit peg. Methods Six unmodified glenoid components with three pe- ripheral pegs, a large, central press-fit peg and six modified glenoid components with one inferior peripheral peg sharply removed were cemented into bone substitute polyurethane blocks. A modified rocking-horse test was completed by com- paring superior- and inferior-edge displacement before and after 100,000 vertical motion cycles. Then, a torsional failure test applied 2 N axial load, followed by a rotational force to the glenoid component at 0.5 °/s until failure. Results Modified rocking-horse testing showed no statistical- ly significant edge displacement at the superior or inferior aspect of the glenoid component before or after testing. During torsional testing, peak torque and degrees of rotation at failure also showed no significant difference. 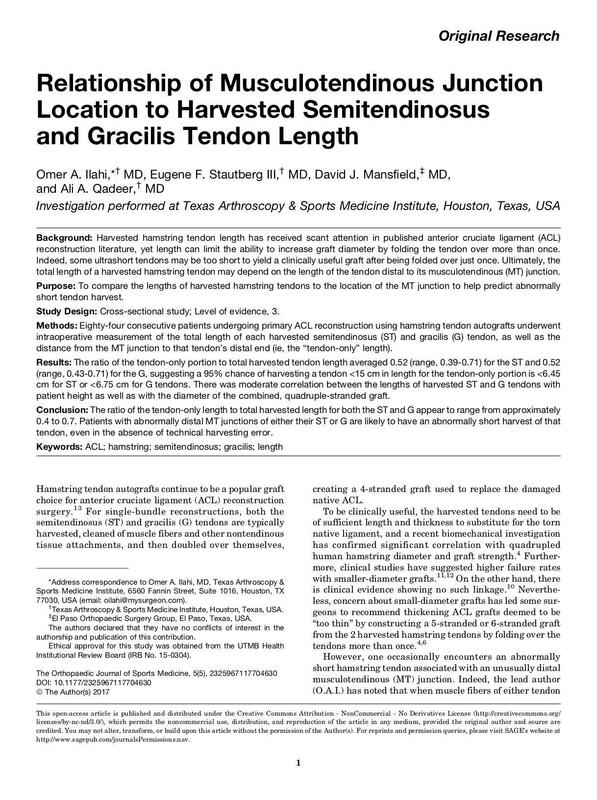 Relationship of Musculotendinous Junction Location to Harvested Semitendinosus and Gracilis Tendon Length. Orthopaedic Journal of Sports Medicine. 2017 May 9;5(5). doi: 10.1177/2325967117704630. Ilahi O, Stautberg EF, Mansfield DJ, Qadeer AA. Background: Harvested hamstring tendon length has received scant attention in published anterior cruciate ligament (ACL) reconstruction literature, yet length can limit the ability to increase graft diameter by folding the tendon over more than once. Indeed, some ultrashort tendons may be too short to yield a clinically useful graft after being folded over just once. Ultimately, the total length of a harvested hamstring tendon may depend on the length of the tendon distal to its musculotendinous (MT) junction. Purpose: To compare the lengths of harvested hamstring tendons to the location of the MT junction to help predict abnormally short tendon harvest. Developing a Unified Advocacy Front. AAOS Now. October, 2016. As expectant parents, my wife and I are establishing a game plan on how to be a team—a unified front—in raising our child. We want to be on the same page with respect to discipline, school, and even what type of snacks he can eat (eg, gluten-free candy instead of gummy bears). Building a Culture of Advocacy Involvement. AAOS Now. January, 2016. My father and I have many similarities, but when it comes to recycling, we just grew up in different eras. Every 2 to 3 weeks, I load four trash cans of paper, glass, plastic, and metal into my car and haul it over to the Galveston recycling center. It's a pain, inevitably adding more stains to my car floor. And yet I continue to recycle because, for as long as I can remember, I've been taught the importance of recycling. Now, it is second nature. 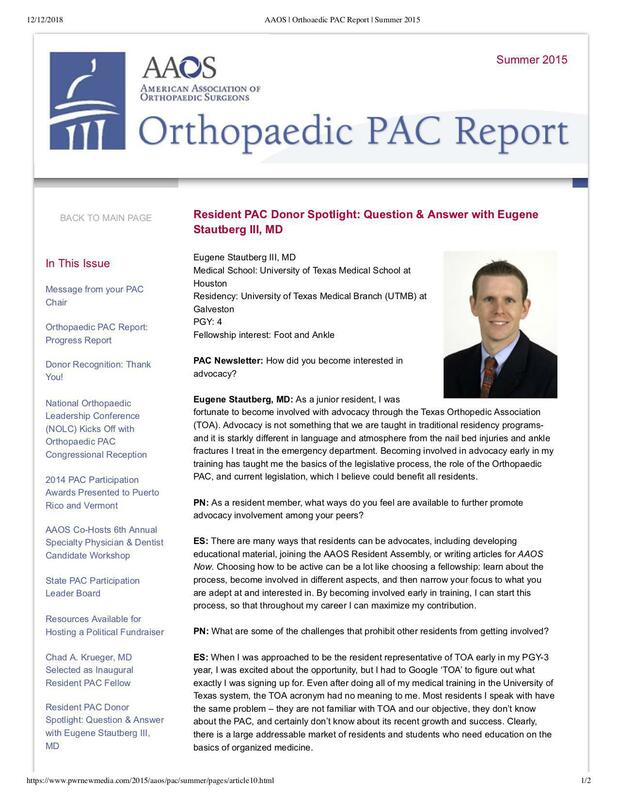 A look at the Future of Orthopaedics in Texas: Q&A. Texas Orthopaedic Association eConnect. 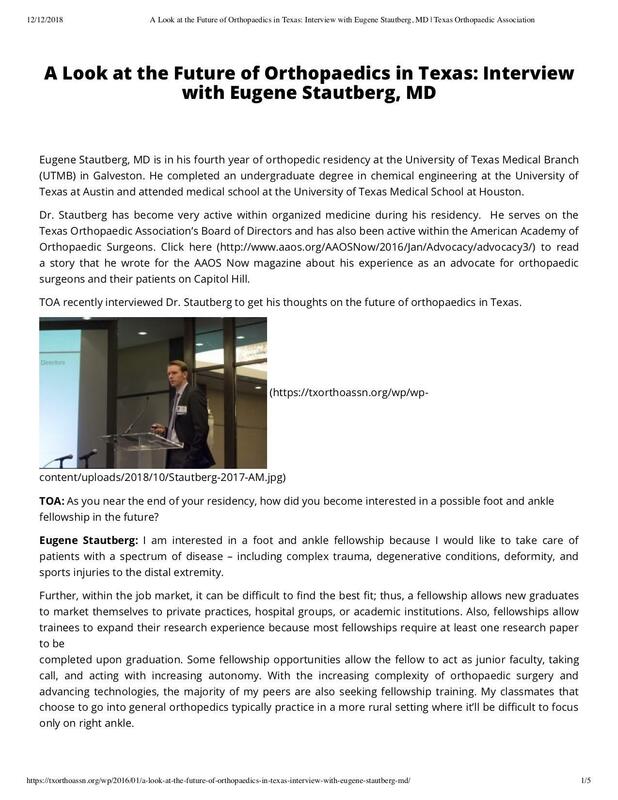 Eugene Stautberg, MD is in his fourth year of orthopedic residency at the University of Texas Medical Branch (UTMB) in Galveston. He completed an undergraduate degree in chemical engineering at the University of Texas at Austin and attended medical school at the University of Texas Medical School at Houston. 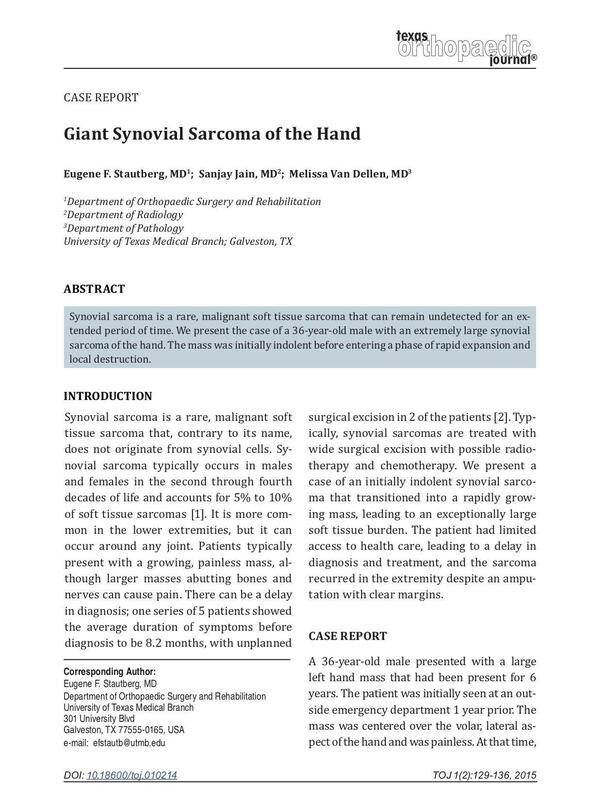 Giant Synovial Sarcoma of the Hand. Texas Orthopaedic Journal. 1.2 Fall, 2015: 129-136. Stautberg, EF, Jain S, Van Dellen M.
Synovial sarcoma is a rare, malignant soft tissue sarcoma that can remain undetected for an extended period of time. We present the case of a 36-year-old male with an extremely large synovial sarcoma of the hand. The mass was initially indolent before entering a phase of rapid expansion and local destruction. 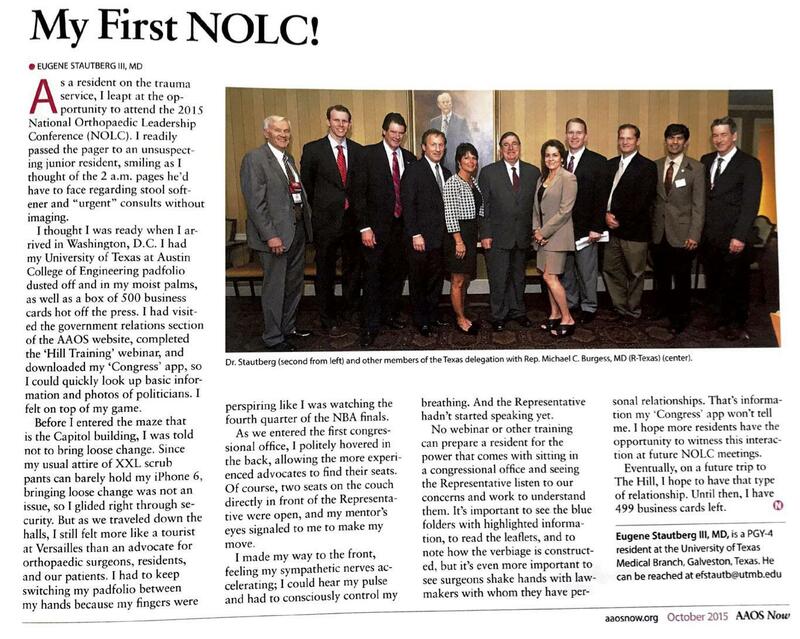 My First National Orthopaedic Leadership Conference - Reflections. AAOS Now. October, 2015. As a resident on the trauma service, I leapt at the opportunity to attend the 2015 National Orthopaedic Leadership Conference (NOLC). I readily passed the pager to an unsuspecting junior resident, smiling as I thought of the 2 a.m. pages he’d have to face regarding stool softener and “urgent” consults without imaging. 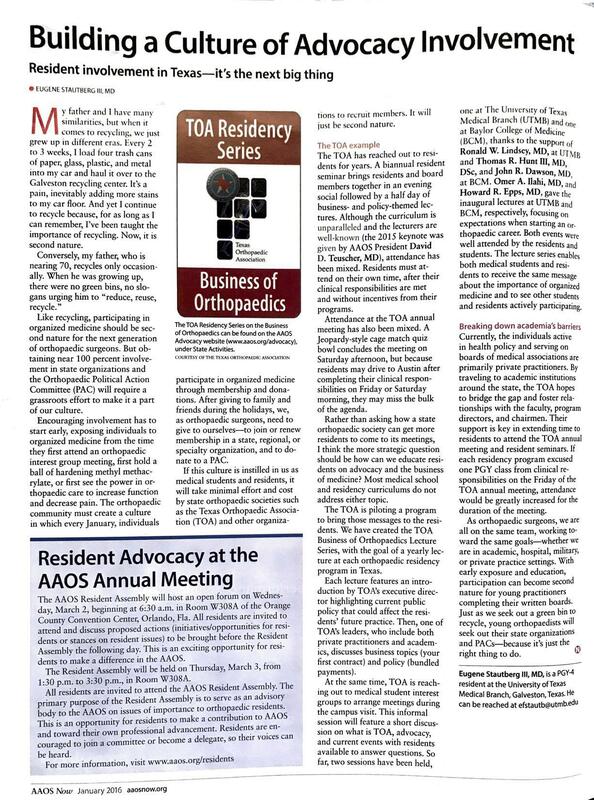 As a junior resident, I was fortunate to become involved with advocacy through the Texas Orthopedic Association (TOA). 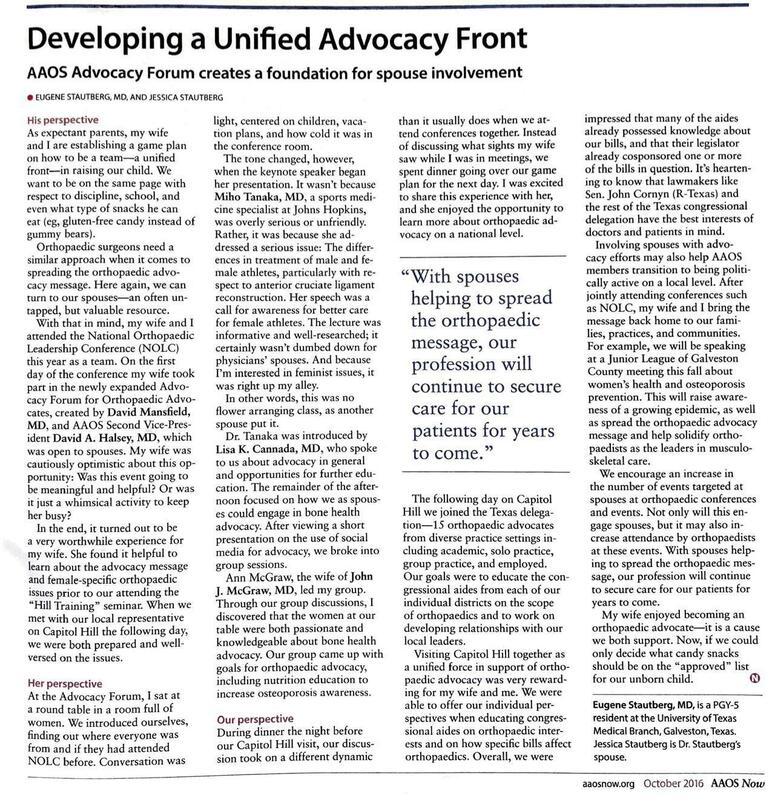 Advocacy is not something that we are taught in traditional residency programs- and it is starkly different in language and atmosphere from the nail bed injuries and ankle fractures I treat in the emergency department.